Stemnucell Review - Why Stemnucell Should Be Your First Choice? Stemnucell Review – Why Stemnucell Should Be Your First Choice? 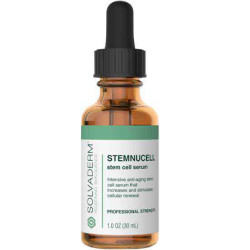 Stemnucell is a brand of serum that is said to use stem cell technology to slow down the aging process at a cellular level. It is made by the company Solvaderm, a reputable manufacturer that produces a wide range of professionally recommended treatments for all skin types and conditions. They sell all their products from their official website which contains full contact details, skincare tips, and advice plus information about the manufacturing process and philosophy of the brand. Stemnucell is to be used as a way of reducing the effects of aging in terms of wrinkles, lines and sagging not only on the facial area but the neck and surrounding areas. The product contains no harmful sulfates or parabens and none of the Solvaderm products are tested on animals. The main active ingredient used in Stemnucell is derived from a Swiss apple which imparts stem cells to affect the skin at a cellular level. The Malus Domestica Fruit Cell Culture heals damaged skin cells and inhibits further signs of aging. It is blended in the formula with the hydrating substance Hyaluronic Acid, an intensely hydrating substance that has the ability to retain up to 1000 times its own weight in water, plumping and firming the skin while smoothing out fine lines on the surface. Also in the formula, in addition to Glycerin and Lecithin is a seaweed extract called Chodru Crispus. This conditions the skin providing nutrients that are hydrating and softening. Because it also has anti-inflammatory benefits, the ingredient reduces any redness in the skin, leaving it more evenly toned and textured. The overall effect of Stemucell when used on a daily basis is to strengthen the skin network, firming and tightening the collagen and improving elasticity. It should be incorporated into the regular skincare routine, applied after cleansing and toning but before moisturizing. Some consumers may be deterred by the cost of Stemnucell but it should be kept in mind that not only does a small amount need to be applied each use, but it is also a very high-quality product from an established, international manufacturer. It is appreciated that the formula works so well simply by using natural, organic substances which have proven successful in independent studies. More information in terms of scientific testing would be appreciated though as would customer and skincare professional testimonials.